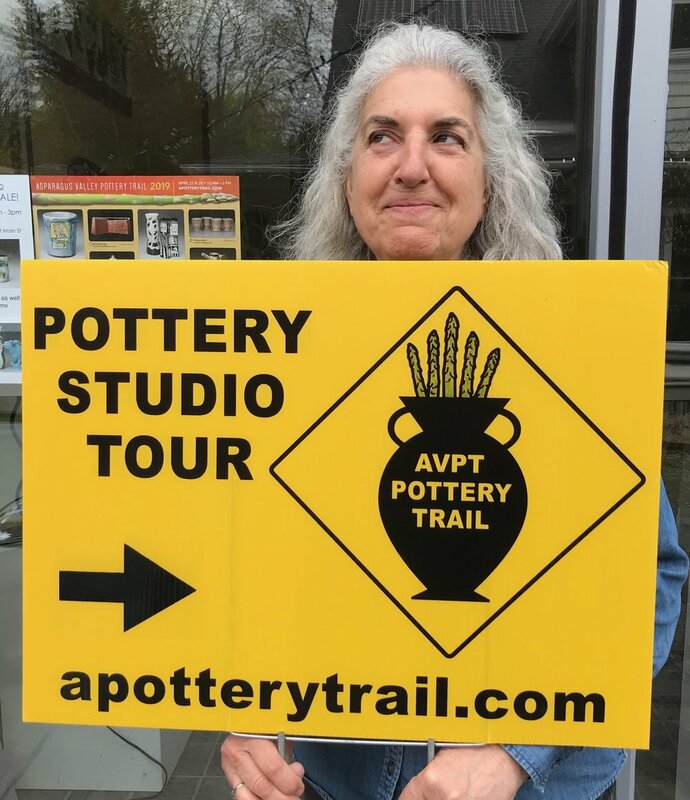 Francine got these two new vases out in time for the Asparagus Valley Pottery Trail. The skinnier piece is 13” in height, the stouter (but still elegant) piece is @12”. 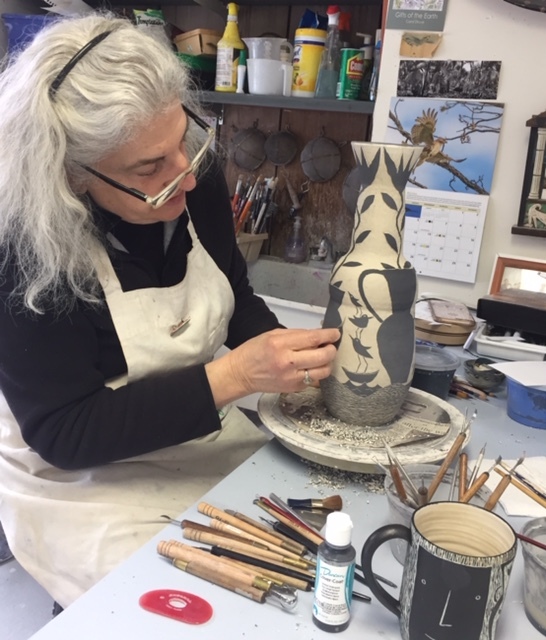 Even though the clay is beige in color and the black isn’t as intense as it is going to be, the pieces drying on the ware give a pretty good idea of what they will look like when they are fired. 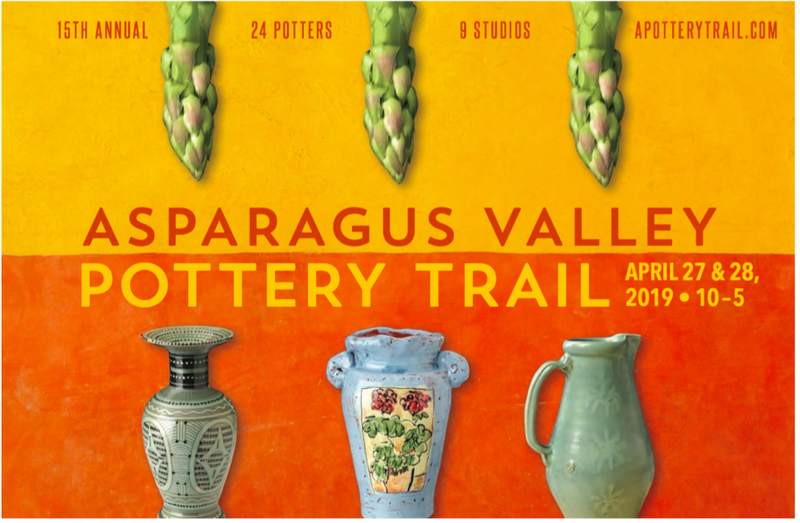 These pieces will soon be high-fired and ready in time for the Asparagus Valley Pottery Trail at the end of this month. More to come ! 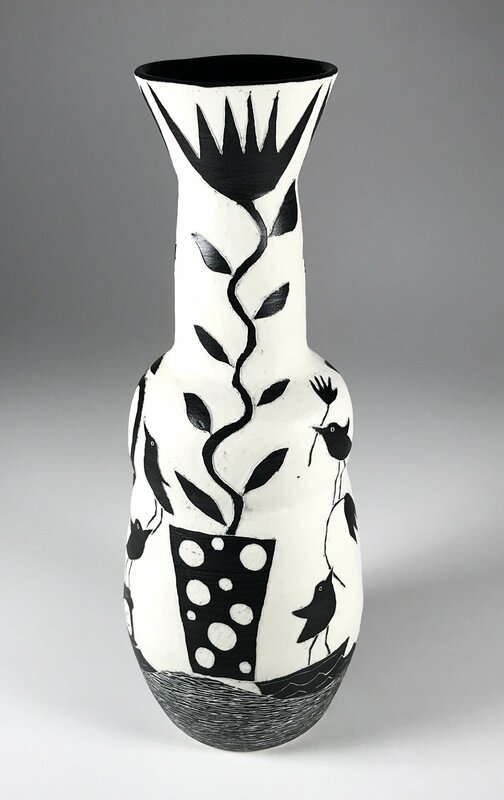 I was dissatisfied with the flower made for the latest imaginary Vase, so i made another one that was closer to the original print that inspired it. This is a quick photo of the change. I am happy that I took the trouble to re-think this piece. this is the 3D side. The height must be at least 30”. This is the 2D side. 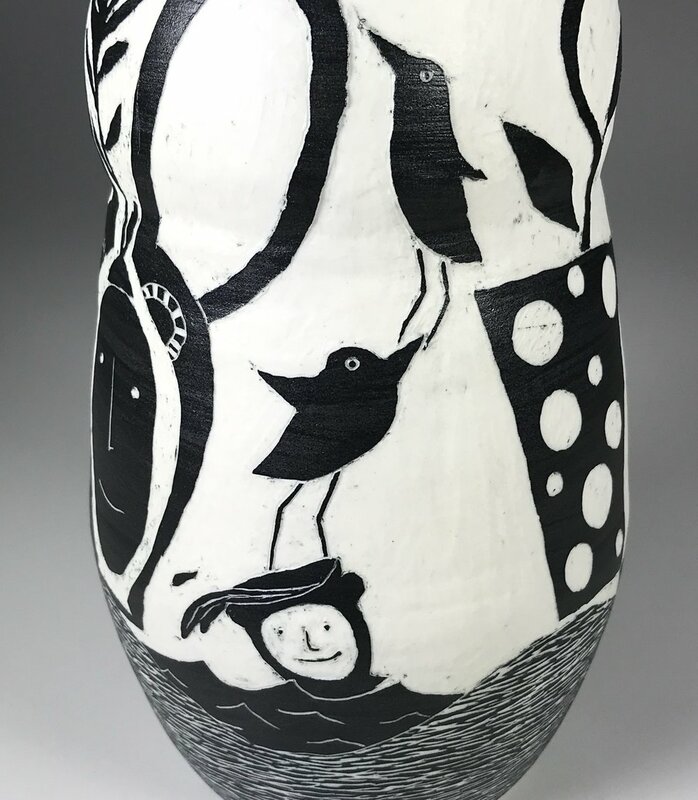 Certain aspects of this piece suggest how to make the next Vases, such as making them in more sections. I have tried this before without success. This time I have a better sense of how to do this. 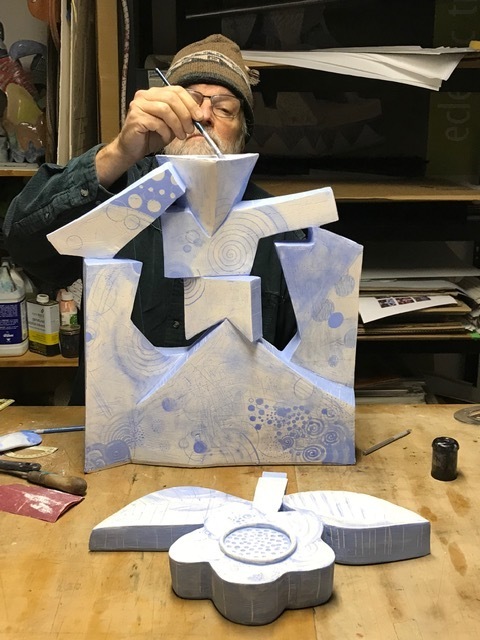 Here are a couple of pieces of me putting the finishing details of a new “Imaginary Vase”. (#5?) I may make a new flower part for this piece. Its not that I don’t like the one I am working on but (although it is difficult to explain) I want to create something that resembles the original drawing/print I made for this piece. The current flower will be used on another piece or a re-working of this piece later. I am “holding” the flower part in place because I don’t trust its being in place yet. It was built separately and was propped up during the building process. I also should be careful about the narrow neck supporting the flower until the piece is bisqued. Here’s a picture of Francine working on an elegant vase. 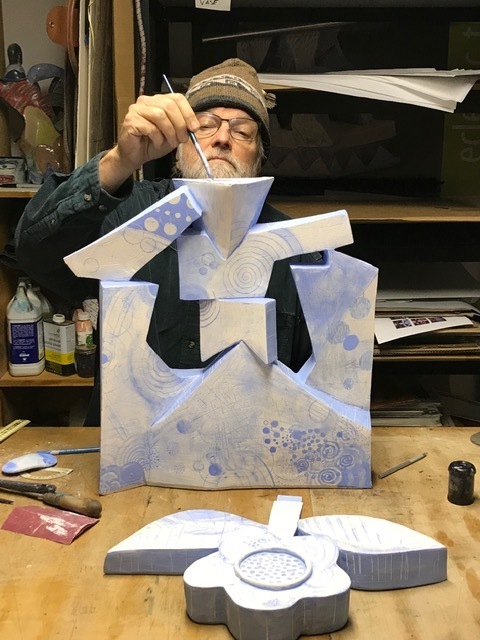 There is still a lot of finishing up to do - fine tuning a piece takes as much time as making it - but this complicated piece will be worth the effort. 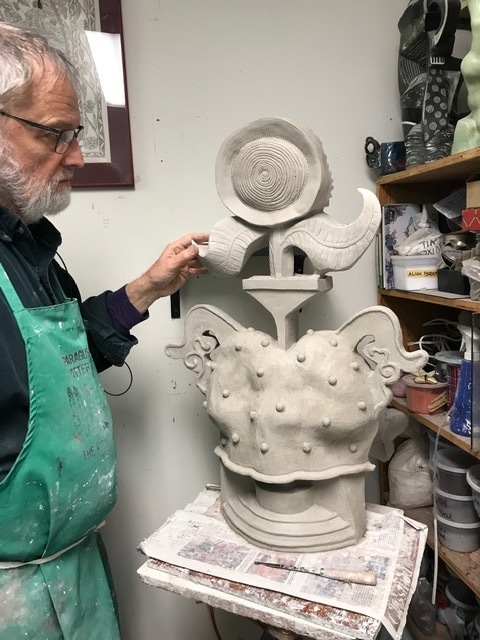 The imagery on the vase reminds me of the details and complexity found in our large wall piece made for the Fuller museum in Brockton. This is where the Fertile Grounds exhibit will soon be opening. 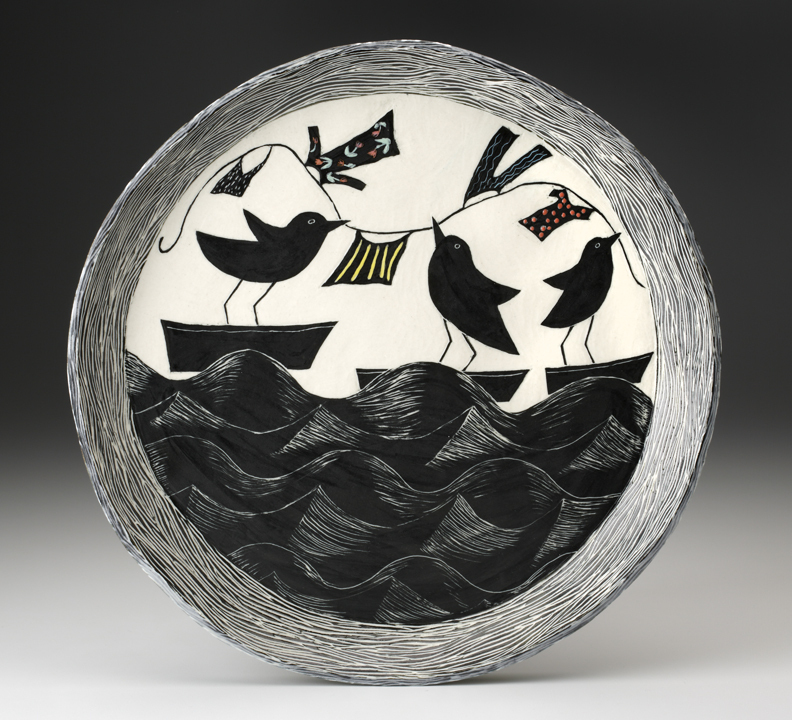 “Landbirds at Sea with Laundry” is a new platter. 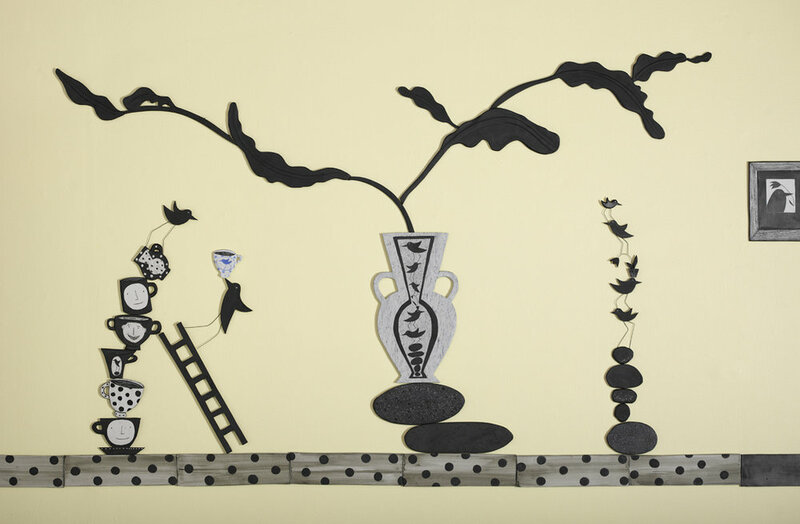 It is similar to a number of other platters that use this theme but the figures and elements are a little smaller, making the environment in which this drama unfolds seem larger. The glazed elements were more generously applied, creating a raised surface. 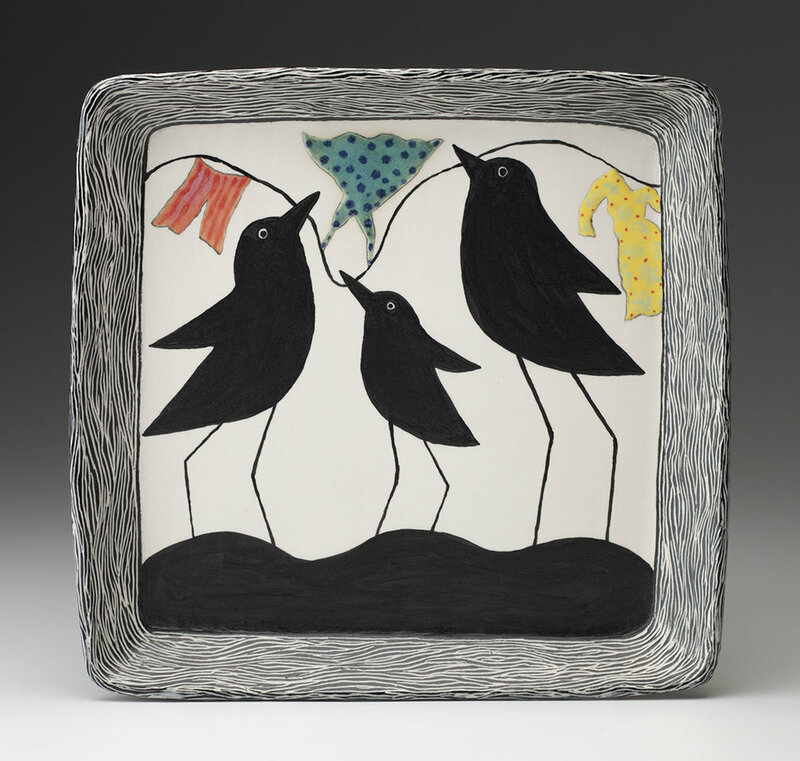 Pictured below is a new Triptych, “Birds and Laundry”, destined for the Fuller Museum’s Fertile Ground exhibit in April. The painted glazes in this piece are significantly “raised”, having a very clean, 3D look. 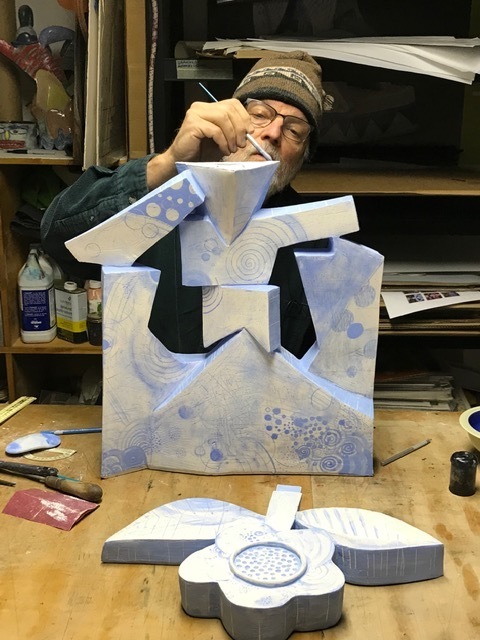 I am showing three new pieces that were recently photographed by John Polak in his studio a few days ago. I am showing them as “front and Back” images becasue the pieces are so complicated and difficult to understand just by seeing one side. I have already shown the first in this series and it looks remarkably tame and simple compared to these three “Imaginary Vases”. 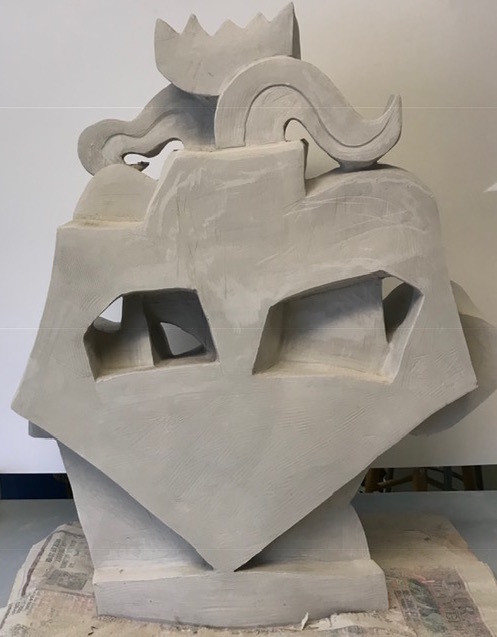 Someone remarked the other day that, because I am making them successfully out of ceramics they are no longer imaginary. 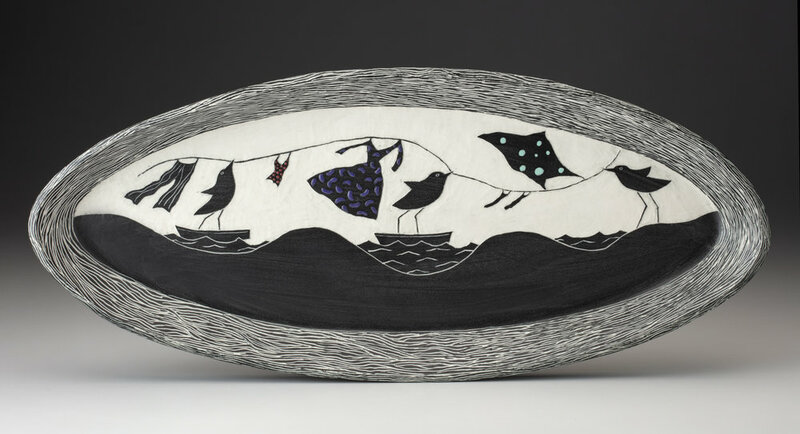 That may be so but I still enjoy referencing the drawings and prints that preceeded these ceramic pieces. 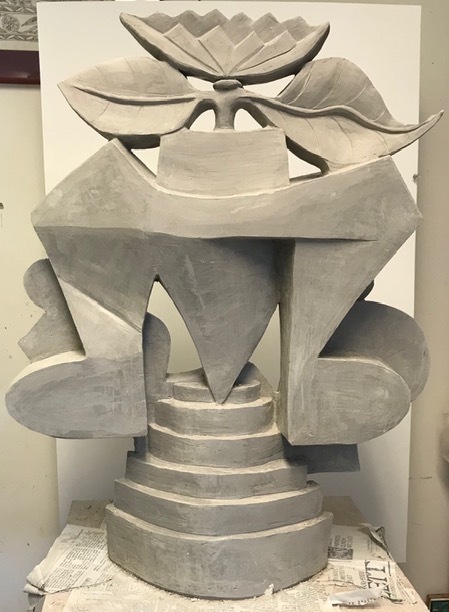 Vase #3 is 22” x 18” x5”, itis fired to cone 6 using a new sculpture body. I sand-blasted this piece to tone down the glaze a little. We continue top et ready for the upcoming Fertile ground exhibitat the Fuller Museum. Some new work, intended for the exhibit will be photographed today by John Polak today. We will post the images after the session. 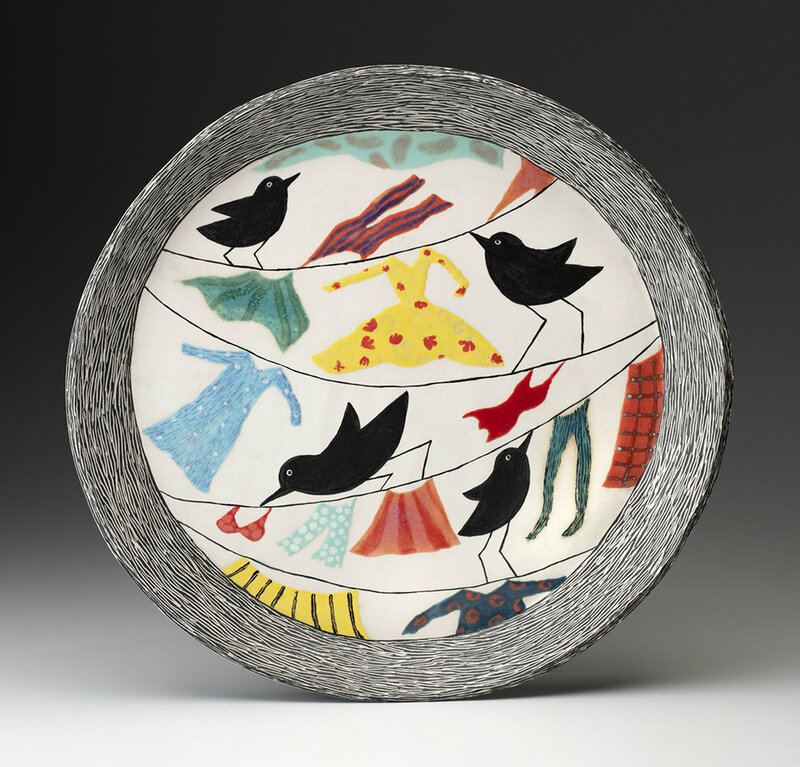 This is one of the pieces that will be included on the exhibit, Fran’s Birds with laundry plate. 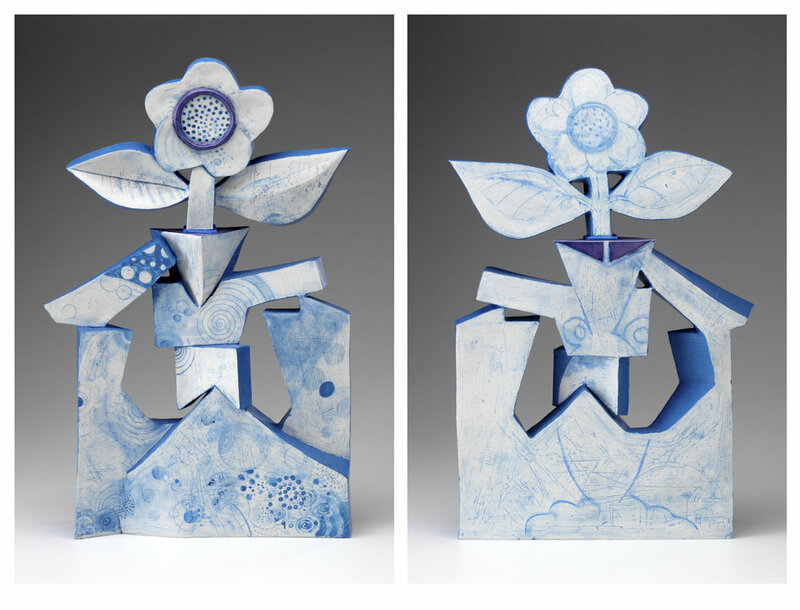 I have continued to explore making ceramic interpretations of the “Imaginary Vase”. 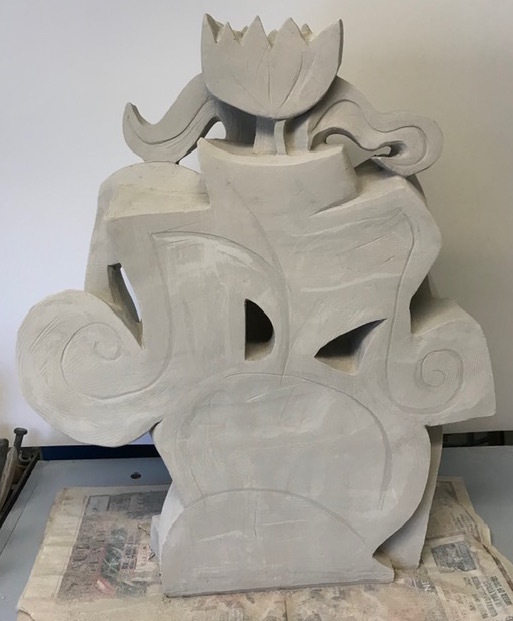 Posted here are two front and back images of a piece that is almost completed in the rough stages of construction. it is still drying slowly and not yet bisqued. 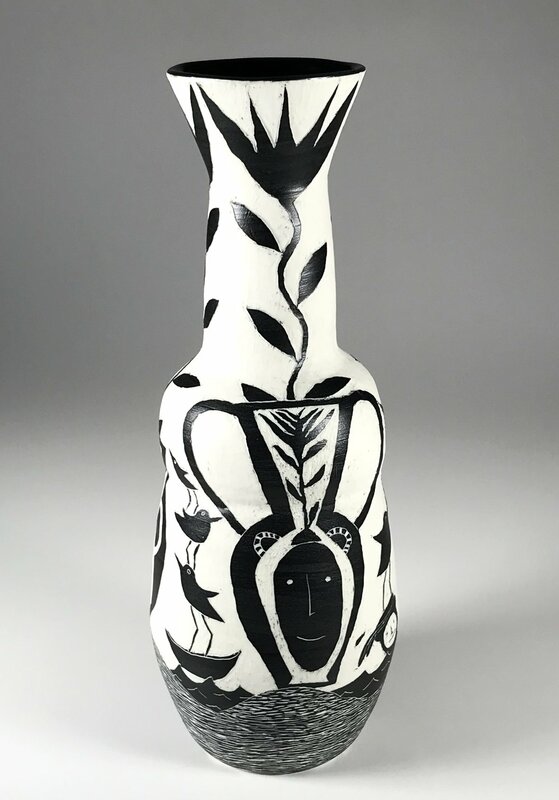 Imaginary Vase 2 is 25” tall. I made very specific drawings for this (silhouettes of the front and back) but had to think very carefully when it came time to join the elements from one side to the other. Decisions made somewhere in the first few inches of the piece affect the rest of the piece - a careless moment in the beginning creates unsolvable problems at the conclusion. 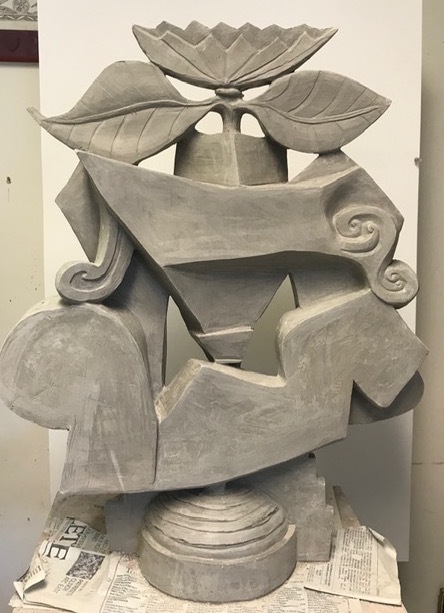 While having some experience from the first vase, this piece presented its own problems but it also is larger and used a lot more clay. The piece weighs at least 50 pounds. Vase #2 is sitting next to me while it is drying, while I construct Vase #3. 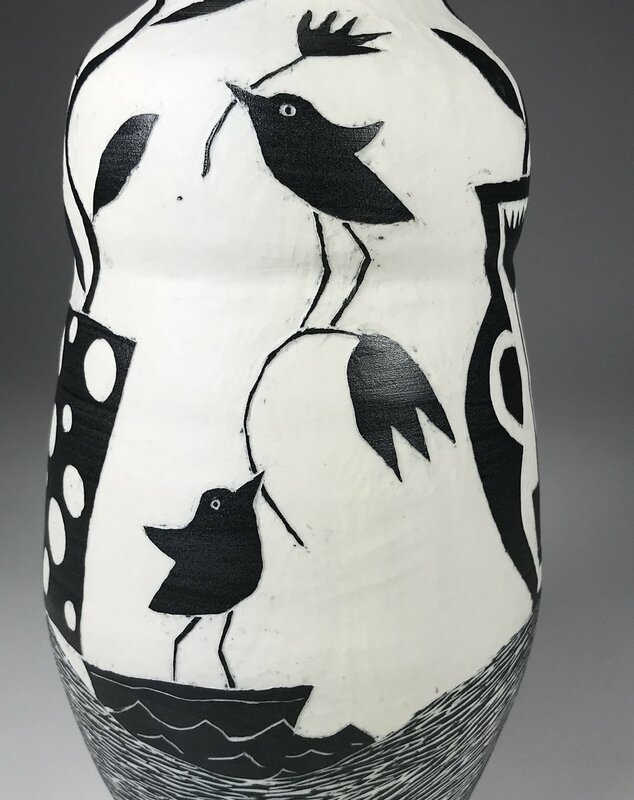 #3 has similar proportions to the piece pictured here and uses a new clay stoneware body. I rediscovered that whenever any major or minor change happens in working in clay, there is a learning curve that has to be observed. I can discuss that later when I post a picture of the new piece. 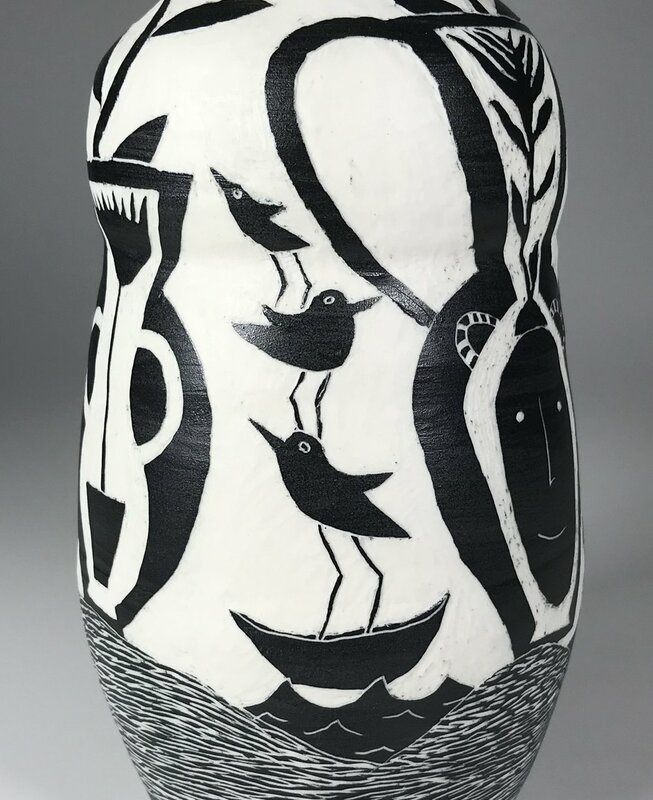 Vase #2 has an interesting mix of geometric and organic, abstract and referential forms. It also has formal and fanciful elements. 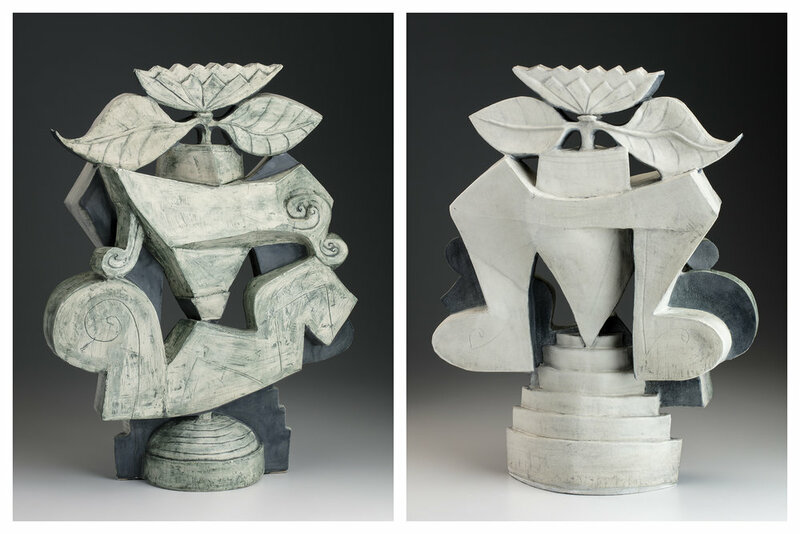 I am not ready to talk about the direction of these works but they do seem to synthesize very complex and serious sculptural forms with seemingly fanciful or simple subject matter. So far, I plan to make this piece more graphic, focusing on a black and white rather than blue and white color scheme. 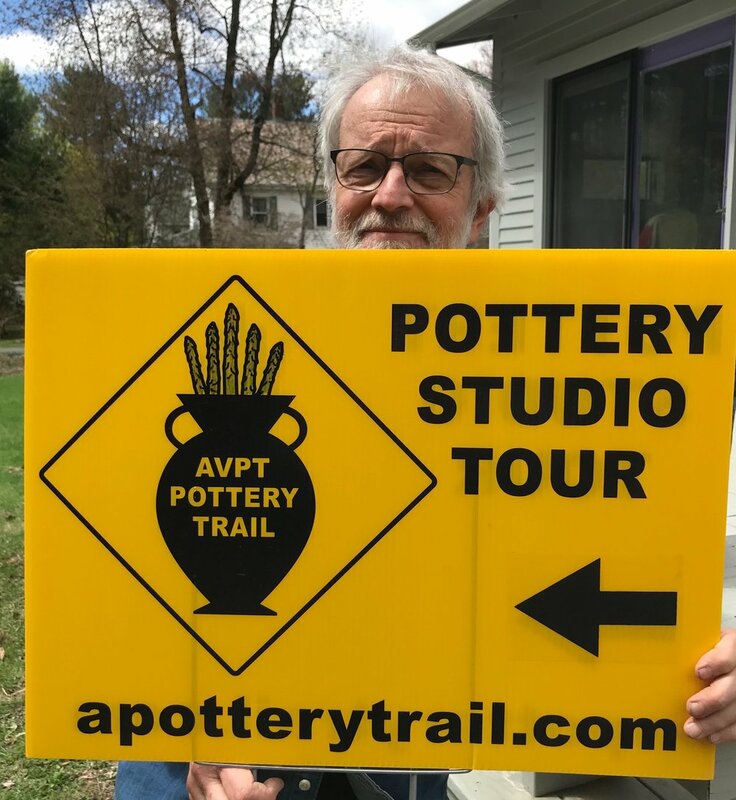 This is the “front page” of the new Pottery Trail brochure. It was designed by Fred Crisp, who always does excellent design work for the Trail. His colors, organization get better every year. This “cover” is part of the proof that he sent out to the members of the trail. All of the little details will soon be worked out, the mailing lists organized and a new brochure will be sent out when the time is right. As promised, here are two images from our John Polak session, this time showing two of Francine’s new plates. Fran and I scheduled an appointment with John Polak to take photos of a couple of new pieces. Pictured here is the first of my Imaginary Vase sculptures. This piece is about 20” high, porcelain, with slips and glazes. 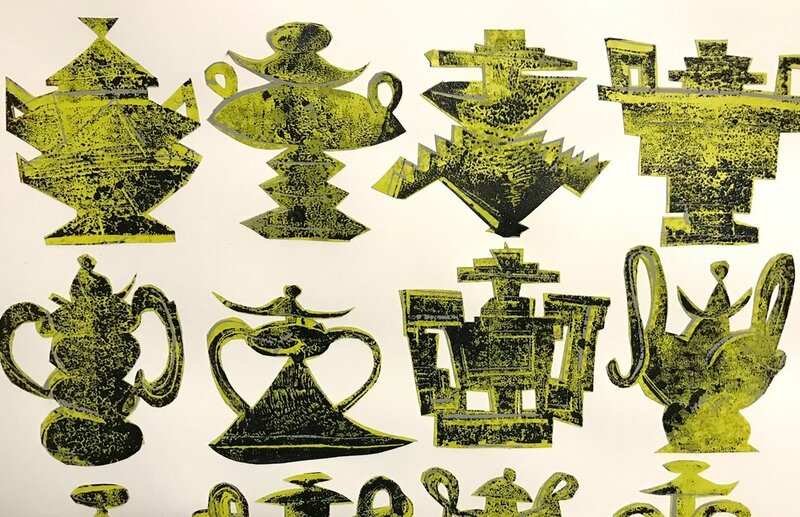 It is the first real attempt to convert some of the many prints and drawings of “Imaginary Vases” (pieces that would be impossible to build in clay) converted into three-D. Another piece will be starting soon. this time is one , rather than two pieces. I will add Fran’s pieces shortly. Front and Back images of Imaginary Vase #1. One side is relatively flat. I don’t know if I will stick to that requirement on the next piece. I do know that the next piece will be considerably more curvilinear. John and Rachael surprised us with an early Christmas gift - a 6’ x 2.5’ rug based on a design from one of my lino-blocks. It is currently located in the kitchen and it is a really striking object. John had to cut and paste the print to fit this format but it works out really well. The rug’s colors are very vibrant. I think the translation of a small print to large rug was very successful. There were many prints to choose from and this particular print was a great choice - either as a one-of or as the first of many to come. two very different locations of the rug, one at our house, the other in Brooklyn. 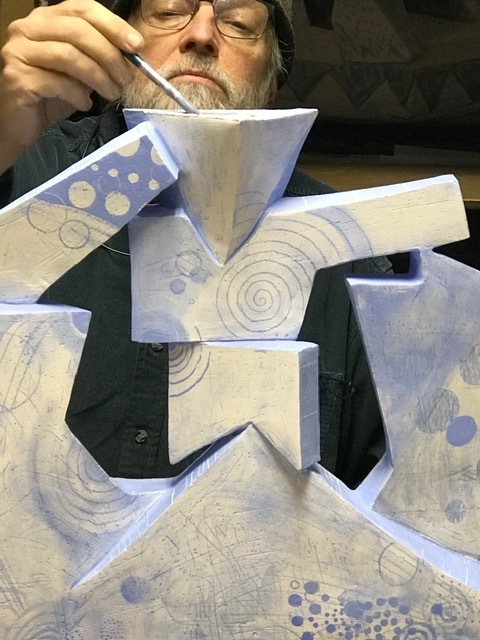 Fran took these pictures of me putting the final touches of my first 3D “Imaginary Vase”. It is two-sided, porcelain, primarily blue and white. The flower in front will be inserted, ) and is removable) upon completion. I forsee a lot many others made in this style and scale. I’ll post the finished piece when it happens. Christmas may get in the way of a speedy completion. We are getting ready for this weekend’s sale in our studio. Some new works have come out of the kiln (Fran’s cups and my Blue and White under-the-sea sculpted cups). We will spend today filling in the empty spaces and re-arranging the items for sale. I am interested to see how people react to the blue and white pieces. One of the pieces that will be shown in my studio is a collage of a print that was shown before on the blog. In this one I cut individual images and arranged them on a a sheet of paper as an entirely new piece. 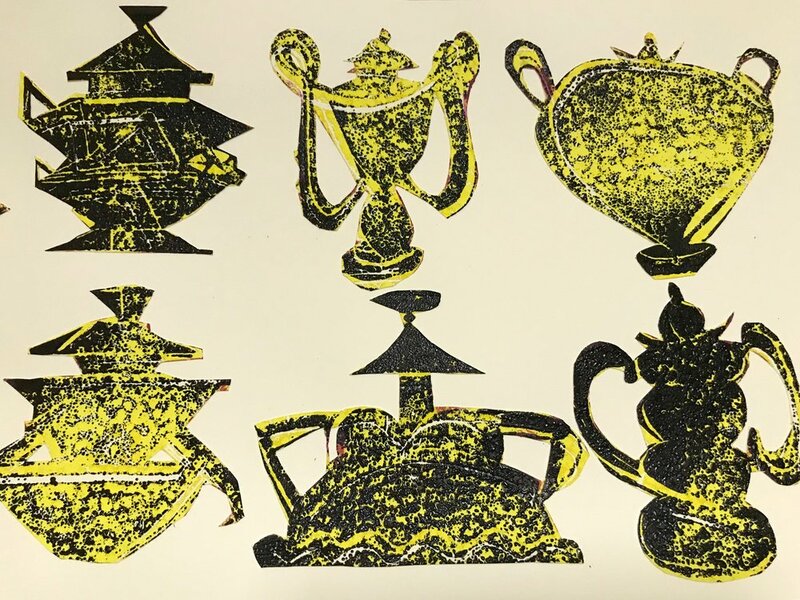 The images shown here are close-ups of the piece showing the textured surface and the layerings of the multiple block lino-cut. Two separate pieces are shown in close-ups. Here are a couple of new cups from the last firing. These are small slab and pinch cups. Some of these are front and back images. @3” high. The weekend sale is over and we are currently shipping out some work. An interesting problem with being a two-person studio is having to box up very different types of work that have very different requirements. There are commonalities in shipping (bubbles, peanuts, double-boxing etc.) of course, but the two examples shown below indicate the differences more than the similarities. Goodbye to “Robot on a Pilates Ball” teapot and “Birds at Sea with Laundry” platter. Safe travels.